Check out our vendor schedule for local AVAILABILITY ! 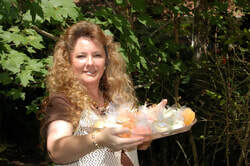 Here is a picture of me, standing behind some of the products that I make. Always keeping the utmost quality for a fun safe product. Thanks for visiting my Artisan products. Check out our schedule of local Farmers Markets and Events on our Facebook. Like us on Facebook and see our "ingredient" feature each week of potential benefits.
. All our soaps sold on this website are not to replace face to face consultation with your healthcare provider. All testimonials posted by our customers are all from individuals and results may vary. There is no guarantee that same results will be achieved in each individual. Remember that special event that you can surprise your host or guests. I custom make all my baskets and boxes. And they come with the same guarantee of the highest quality oils available with no soy fillers.